In the past two years, J. Rotbart & Co. has received enquiries from clients regarding the use of cryptocurrencies for investments in physical precious metals and payments. We believe that the nature of cryptocurrencies is not competitive with holding physical assets in the long term, as cryptocurrencies face unresolved regulatory issues and volatile pricing benchmarks. However, as a modern precious metals company that understands the various needs of our clients, we tailor our services offered so that clients may enjoy the most updated and secure options. Which is why, we are happy to share with our readers that beginning 1st of June, we accept cryptocurrency payments. Clients who have cryptocurrency holdings, may use our platform to engage in the services of a pre-approved, compliant third party, to use cryptocurrency proceeds as payment on all precious metal bullion products and related services (i.e. storage and transportation) – the cryptocurrencies are converted to fiat which is used for the purchase of precious metals that we can deliver to a requested location or stored in a secure private vault. The major cryptocurrencies we accept are: Bitcoin, Ethereum, Litecoin, Ripple, Dash and many more. Client turns in the appropriate KYC documents, indicate interest in type of precious metals, volume and storage location. Confirmation documents are signed by both parties and we send the deposit wallet address to client. Once payment for the requested conversion has been received from client, we facilitate the procurement of the precious metals and deliver accordingly. The process takes a few business days. Client will of course receive a storage receipt and manifest with details of gold, silver, platinum, palladium bars and coins. Cryptocurrency exchange rates are in a constant state of flux, and our team works closely with the client to optimise the value of the cryptocurrency per client instructions. We are also able to accommodate requests to convert precious metals into major cryptocurrencies, also within a few business days. To tackle the concerns that cryptocurrency assets may be used for money laundering and/or tax evasion and/or criminal purposes, we applied the same stringent due diligence policy we currently exercise on traditional banking transactions: Client must disclose his/her wallet address and declare the source of cryptocurrencies. We conduct enhanced due diligence to ensure the integrity and legitimacy of the clients. In addition, we only work with third parties that have gone through screening and are compliant. We are also engaged with a reputable cutting edge technology firm, which analyses the blockchain record to confirm that the coins were not originated from unlawful activities. Our cryptocurrency ledger stays safe in a vault as well. Many investors prefer the purchase of physical gold or silver to guard against the potential failure of the market, this interest extends to investors who may at this moment hold cryptocurrency assets. We at J. Rotbart & Co. have opened up to this progressive settlement option to encourage clients to consider moving portion of their gains from the cryptocurrency world to stable and safe physical assets, such as gold, silver, platinum and palladium. 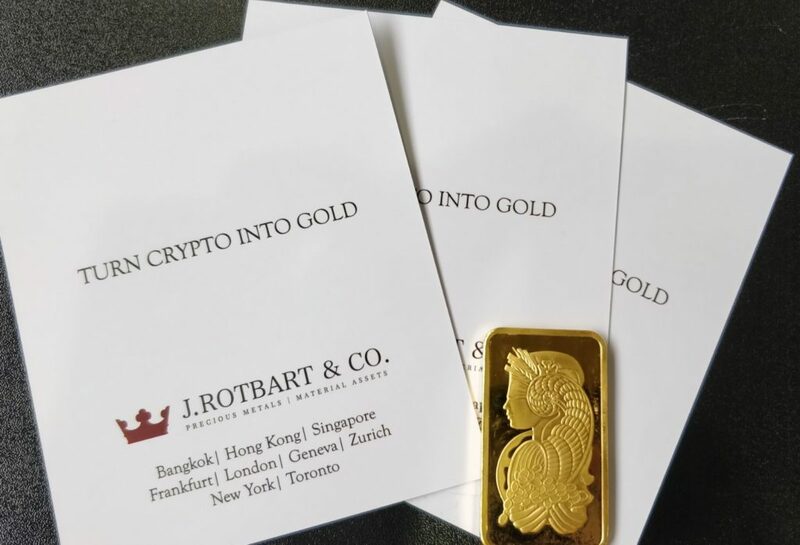 Please do not hesitate to write us at info@jrotbart.com should you need further information on buying and storing gold, silver, platinum, and palladium, by using cryptocurrencies.